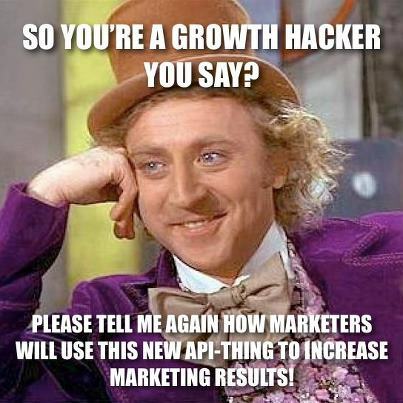 The term “Growth Hacker” has been circulating around tech blogs for the past couple months, and I think the overall discussion around creating scalable, long-term growth is extremely important. As someone who is a current marketing student, with a few years of a semi-technical background (working on that right now), I’ve been reading these posts with anticipation that I will find something valuable that I can focus on during my last year of college. It seems like startups are pursuing someone who understands marketing at a deep level, yet has a firm grasp on the technical aspects of the business. According to Andrew Chen, a “growth hacker” uses A/B testing, tons of analytics, and leveraging “super platforms.” While I won’t argue that these skills are critical, why are people with these skills outliers? Why aren’t they a norm in our startup obsessed subculture? I’m not gonna lie, I enjoy networking more than I enjoy unit testing, but the more I program, the more I realize that anyone can learn this stuff. It’s not rocket science, it just takes motivation and patience. There are so many resources online nowadays, there’s no excuse NOT to learn. Technology is changing at such a rapid pace, I believe the disconnect is only going to get worse. Marketers are going to make more and more horrible suggestions to programmers, further isolating the teams (and overall progress). Sure, marketers aren’t always the problem, but many people think programmers are like hermits – afraid of the world, and unable to carry on a decent conversation. In reality, some of the smartest people I have ever met hack on computers for a living. With the rise of these “super-platforms” (Facebook, Twitter), marketers are preying on the ignorance of their business colleagues. Using nearly worthless data (i.e – “likes”, re-pins, engagements), these people suggest that their campaigns have a positive effect, when the majority of the time, there’s very little qualitative evidence to prove it. I’ve seen “marketers” play with these metrics, manipulating information to prove their worth. It’s sad, but it’s very common. I’ll admit that it’s not always the Marketers fault. Many clients measure success on vanity metrics, which creates a sticky situation that often leads to unethical practices (purchasing Facebook “likes” for example). I distinctly remember sitting through a class last year where a student asked, “Does Google own the internet?” We live in a culture that is constantly using technology, yet has no idea how it actually works. This is the future my friends. I never expect the masses will understand how to read a Google Analytics dashboard, but I hope that marketers will. It’s not happening in college. Not one bit. I’m a little afraid that these idiots will be bossing around the people that actually understand the web, and have the skills to make a difference. As I wrap up with my final point, I must stress that “**soft skills” are extremely important, **but for the life of me, WHY are marketers ignoring the technical stuff? Do you not realize that your entire business (especially web-tech) is built off lines of code? Why don’t you think that’s important enough to learn? I’m not saying you should be an amazing hacker, but can you carry on a decent conversation with a programmer at least? Wake up my marketing friends, let’s get up and start making real-progress. If you work at a web startup, you should be a growth hacker. And please stop referring to yourself as one – that’s annoying. Feel free to yell at me on Twitter. Next post Looking back, is College worth it?